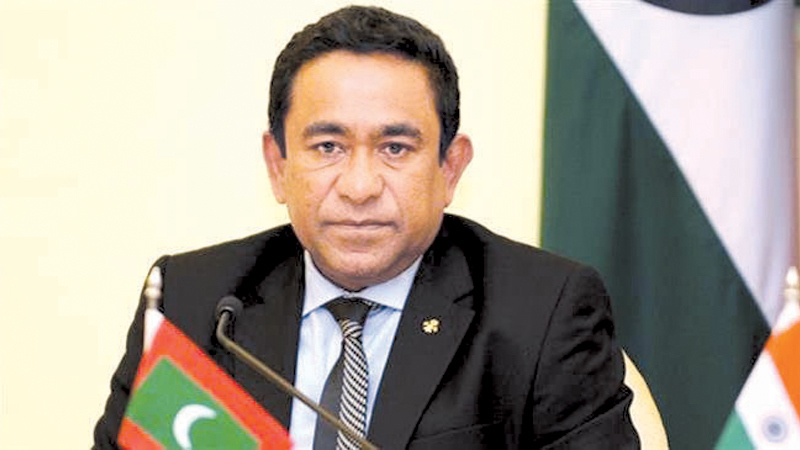 Maldivian authorities Monday ordered the arrest of former President Abdulla Yameen over money laundering charges, officials said. The arrest came after a court began a preliminary hearing into allegations that Yameen received nearly $1.5 million in illicit payments just before he lost his re-election bid in September. “Prosecutors said that Yameen had allegedly attempted to bribe witnesses,” a court official said, adding that the former president would be taken to the Dhoonidhoo prison island near the capital. Yameen, who came to power in 2013 and jailed many of his opponents or forced them into exile, had been summoned to the Criminal Court Sunday to formally receive his indictment. During his five-year tenure, Yameen relied heavily on China for political and financial support as he came under criticism over his dismal human rights record. The Indian Ocean archipelago nation of 340,000 Sunni Muslims is heavily in debt to China. Authorities believe millions of dollars allegedly siphoned off by Yameen could be stashed abroad, and have said that talks are underway with foreign entities to repatriate any cash found.